iRealHousewives | The 411 On American + International Real Housewives: Sneak Peek: RHONJ Season 8 Premiere Episode — Melissa Gorga And Teresa Giudice Get Into A Cake Fight, Siggy Flicker And Melissa Argue Over Kim D! 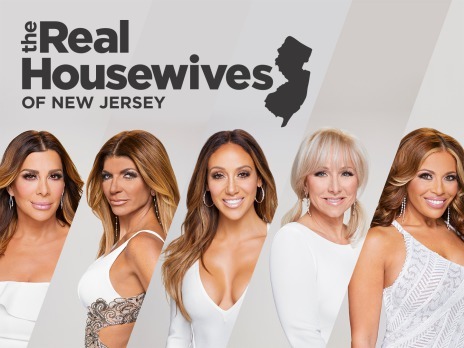 Sneak Peek: RHONJ Season 8 Premiere Episode — Melissa Gorga And Teresa Giudice Get Into A Cake Fight, Siggy Flicker And Melissa Argue Over Kim D! On Wednesday's Season 8 premiere episode of The Real Housewives of New Jersey — as Teresa Giudice struggles with the loss of her mom and the reality of being a single parent with Joe still in prison, her friends plan a weekend getaway to Boca Raton to try to give her some rest and relaxation. Meanwhile, Dolores Catania's ex-husband Frank moves back in and Siggy Flicker's career aspirations cause friction in her marriage. Later, Siggy introduces Margaret Josephs to their group, but tensions flare when Danielle Staub makes her return. Watch a sneak peek preview below! In this first preview clip, a month after their mother's passing, Joe Gorga and Teresa Giudice help pack up their dad's home. In this other clip, the ladies celebrate Melissa Gorga's birthday and Siggy gifts her a beautiful and expensive cake, which Teresa and Melissa ruin by getting into a cake fight, leaving Siggy in disbelief. In this WWHL preview clip, Danielle and Melissa talks about their issues with Kim D, then Siggy and Melissa get into an argument over Kim D.
The ladies are introduced to newbie Margaret Josephs and while she doesn't drink, there is one drug she recommends.